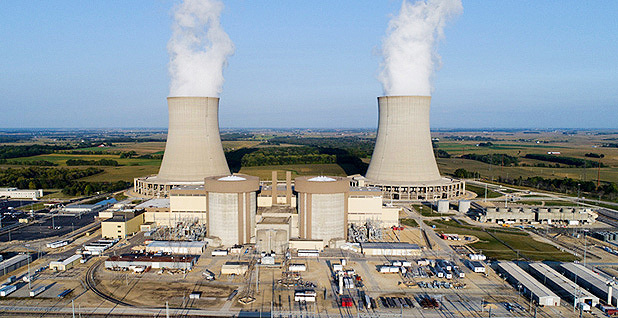 Byron Generating Station, a nuclear plant in Byron, Ill. Exelon Corp. The Department of Energy's national security policy proposal to guarantee business for money-losing coal and nuclear power plants directly challenges the authority of the independent Federal Energy Regulatory Commission, responsible for safeguarding the nation's power supply, energy lawyers agree. It would also end-run regional transmission operators (RTOs) that operate the grids serving two-thirds of the U.S. population under FERC oversight. DOE's justification: FERC isn't acting quickly enough to keep up with insidious advances in cyber weapons developed by Russia and other adversaries. "[T]oo little progress has been made while the risk of high-impact events, especially caused by intentional attacks, continues to grow," said the DOE draft plan that leaked Friday ahead of a National Security Council meeting. DOE's reach for control of the U.S. power grid under Energy Secretary Rick Perry — a former Republican governor of Texas — is a whiplash reversal of how some GOP governors reacted to President Obama's Clean Power Plan, waving the states' rights banner to protest EPA's response to climate change, which they portrayed as an unauthorized Washington power grab. Today, under Perry, DOE says it "must exercise its authority" to intervene in electricity markets because of the severity of the threats. DOE is citing authority under the Federal Power Act and the Defense Production Act, a Korean War-era law designed to enable swift emergency action in response to national security crises. The reaction of the regional grid operators is implicit in page after page of the voluminous comments on extreme threats submitted to FERC this year in its grid resilience docket exploring the problem of securing the grid: Hands off, it's our job. "Because each region is unique," ISO New England said, each region's grid operator is, and should be, responsible for determining the risks its systems face. "Resilience must account for regional differences," said the California Independent System Operator. It and other grid organizations "must have flexibility" to determine what's needed, it said. PJM Interconnection, the Eastern grid operator for 65 million Americans, whose comments to FERC were the most outspoken of the RTOs, said more and faster action on threats is vital. But the orders should come from FERC to the regional operators, said PJM, which manages the high-voltage grid in the Mid-Atlantic and eastern Great Lakes areas. FERC Chairman Kevin McIntyre appeared to signal that DOE's plan, if it becomes administration policy, would wind up at his agency. "In a sense, it would almost be bread and butter. We'd have to figure out how to get the dollars and cents right," he told an energy conference Tuesday. But while there are many unanswered question in the DOE draft plan, its intent seems clear: to take the wheel. Its two-year plan would order grid operators and integrated utilities to pay some DOE-selected coal and nuclear plants to remain in operation. DOE says that with their "on-site" fuels, coal and nuclear generators provide a crucial level of grid resilience that pipeline-dependent gas-fired generators and renewable power cannot. DOE's opponents say it's a conclusion with a transparent political motive of boosting the fortunes of the U.S. coal industry, where President Trump found crucial election support in 2016. During the two-year window, DOE would determine which electricity systems and gas pipelines are critical for ensuring that military installations get the power they need and where power outages could cause the most damage. The DOE plan said this review "has never previously been undertaken," which appeared to ignore a library of studies, analyses, surveys and "war games" directed at grid vulnerabilities, including gas-fired generators' dependence on natural gas pipeline deliveries. In one revealing example, Gordon van Welie, chief executive of ISO New England, has identified exactly which power plants must be kept operating as insurance against blackouts in a very extreme winter blast: namely, Exelon Corp.'s 1,400-megawatt gas-fired Mystic 8 and 9 generators in Everett, Mass. Exelon has announced plans to close the units in 2022 unless it gets more revenue from their power sales. Van Welie has said that while his organization can offer additional revenue by designating the units essential for grid reliability, Exelon is free to say no. "It is important to note that ISO New England has no mechanism or authority to invest in, or direct investment in, natural gas supply infrastructure or any fuel infrastructure," van Welie told a Senate committee in January. What does ISO New England want: Van Welie didn't ask for the proposed two-year DOE study or a revenue boost for generators at DOE's discretion. Instead, he wants FERC's immediate approval for the Exelon units to receive higher revenues based on the units' operating costs. That would allow time to create a new tariff governing electricity rates that specifically allows ISO New England to retain units like the Mystic turbines for fuel security regions, van Welie said. Other RTOs have spelled out critical gaps in moving from threats and problems to action. The Southwest Power Pool, which stretches from the Dakotas to the Texas Panhandle, cited FERC's requirement that selected transmission owners evaluate risks of catastrophic events on the most critical substations, including the loss of a substation that could cause a cascading outage on the interconnected U.S. grid east of the Rocky Mountains. But SPP also acknowledged that a power plant or transmission line owners could simply refuse to make investments that SPP determines are needed to protect against extreme disasters. A statement by the Electric Reliability Council of Texas (ERCOT) put a finger squarely on the threat-action gap in the case of low-probability, high-impact threats like a widespread cyberattack. 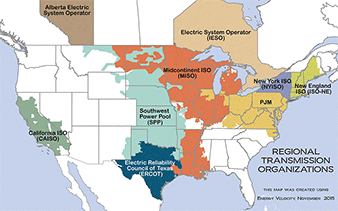 The North American Electric Reliability Corp.'s reliability standard TPL-001 requires ERCOT and FERC-regulated transmission organizations to consider a range of extreme events in their operations planning. "Because these extreme scenarios are generally thought to be less likely to occur and would often require substantially greater cost to address, the NERC reliability standard does not mandate that planners address these issues through a corrective action plan," ERCOT's statement said. PJM's comments to FERC in the resilience docket went the furthest in challenging the commission to act to meet the gravest threats. It called on FERC to draw on classified government intelligence to define the extent of the extreme cyberthreats that grid operators, generators and utilities must defend against — a "design basis threat" modeled on Nuclear Regulatory Commission standards for U.S. reactor operators (Energywire, April 17). PJM said the commission must demand that natural gas pipelines share confidential operating information if needed to help ensure reliability of gas-fired generation. Currently, PJM has no authority to order generators to disconnect from the grid in the face of a dangerous cybersecurity threat or to pay generators to keep running in other emergencies. FERC can fix that, PJM said. "Simply put, RTOs need to be expressly empowered [by NERC] to lead on resilience," PJM said. Beyond that, FERC must hold RTOs accountable for meeting resilience requirements. "In order to give RTOs an affirmative role in planning for resilience, they must have clearly articulated authority to do so. This can easily be accomplished by the commission," PJM added. In January, after FERC rejected Perry's initial policy move to protect coal and nuclear plants, asserting their critical role in grid resilience, McIntyre testified to the Senate Energy and Natural Resources Committee and was asked how fast FERC would move to address the threats confronting grid operations. "How prompt will FERC be when it says it will act promptly?" asked committee Chairwoman Lisa Murkowski (R-Alaska). "We need to move beyond technical conferences and more white papers, and we actually need to see that action," she said (Energywire, Jan. 24). "A very valid question," McIntyre said. "Our commitment is to prompt action."